Clinical Professor in the Faculty of Medicine at the University of Alberta in Edmonton. We can’t solve our problems by using the same kind of thinking we used when we created the problems. A growing phenomenon continues to fracture contemporary clinical medicine. We now have orthodox medicine, naturopathic medicine, ayurvedic medicine, environmental medicine, osteopathic medicine, complementary and alternative medicine, functional medicine, restorative medicine, and so on. Mainstream physicians generally believe that conventional medicine is scientific and that alternative medicine is unscientific1; alternative practitioners, on the other hand, generally believe that conventional practitioners are ill equipped to facilitate health and healing. Although each group shares a common desire to help patients and sincerely believes it has answers for the health care challenges of today and tomorrow, the expanding divide between professional health disciplines is confusing for patients and problematic for those crafting health policies. It behooves medical organizations to address the rift between conventional and alternative health care for the sake of patient well-being and the future of clinical medicine. Fractures and splits are often a barometer of the level of dysfunction within an institution—this is certainly evident in contemporary health care with escalating rates of chronic disease,2,3 poor morale within the medical community,4 health care systems in disarray,5 alarming rates of medical errors,6 and so on. 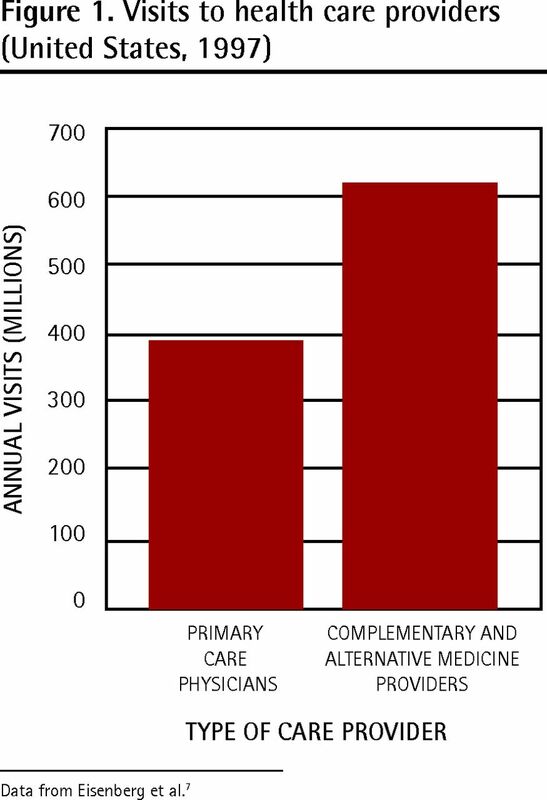 In this milieu, there are countless suffering patients scrambling to find solutions for their health concerns, and recent evidence suggests there are now more visits registered to nonallopathic practitioners in America than to conventional primary care physicians (Figure 1).7 In fact, the demand continues to escalate, with current reports estimating that $5.6 billion, or about $166 per capita, is spent annually on nonconventional health care in Canada.8 Physicians often feel slighted when patients seek help elsewhere, yet the escalating demand for nonallopathic approaches frequently represents dissatisfaction with outcomes obtained through conventional medicine. Rather than collaborating to optimize patient outcomes, however, disparate medical groups continue to allow tensions to divide them. Conventional medical advocates have often alleged that the divisions within health care are destructive and expressed the sentiment that until “people themselves are better educated concerning the danger and iniquity of quackery, they must be protected from the forces that prey.”10 Some suggest that perhaps discourse in science and medicine should be constrained in order to avoid confusion for health consumers and to preclude loss of trust in conventional approaches and institutions. Recognizing that the scientific literature defines a “discipline’s objects of study, methodologies, and discursive conventions,”11 some seek to influence the policies of scientific journals in order to control the production of knowledge in a given field by requiring authors to stick to “dominant discursive conventions”11 in order to get published. Within this mindset, journals might disregard or reject submissions considered unconventional and limit what information can be categorized as credible knowledge, thus determining who has the power to speak about a given field of study. In addition, some of the ongoing fodder for anti-alternative sentiment is provided through websites and publications originating from individuals with scientific training who customarily disparage unconventional attitudes and therapies in health care.12–14 Allegedly acting as sentinels to expose contemporary health fraud and “quackery,” their message is often vitriolic toward physicians who incorporate nonconventional approaches, all the while exhorting consumers to pursue conventional health care.12,13 Using scientific vernacular, such diatribes are effective in manufacturing doubt15 and maintaining unreceptive attitudes toward alternative care. Detractors of conventional health care point out that statistical improvements in life expectancy data, rather than validating contemporary health care, primarily reflect steep declines in infant mortality resulting from innovative neonatal care, combined with advanced interventions for trauma, cardiac events, and infectious disease; such acute care is widely esteemed. Overall, however, “the neglected epidemic of chronic disease,”32 rampant iatrogenic illness,27 and inattention to prevention33,34 have led critics to assert that mainstream medicine is failing as a results-oriented profession, and that integration of alternative approaches is required. With unrelenting acrimony between competing health care disciplines, how do we proceed? A comprehensive analysis of any issue involves a study of its history; there are lessons to be gleaned from a glimpse into bygone medicine. Does this mean we should accept every new theory or uncanny intervention that emerges? Hardly. Ineffective, fraudulent, and dangerous therapies have also been peddled throughout medical history by misguided practitioners or charlatans delivering grandiose claims. The “quackery” movement of 18th-century Holland and the “snake oil” phenomenon of 19th-century America highlight examples of health care gone awry. Any move forward will require that we vigorously pursue scientific rigour to distinguish fact from fiction in clinical medicine and to protect the public from foolhardy offshoots and outlandish remedies while remaining open to innovative advances. The role of another historical determinant in the contemporary health care diaspora must also be considered. In review, alongside a mainstream reluctance to consider unfamiliar approaches and the covert shadow of corporate sway,39,51 a diverse spectrum of sincere health care providers is juxtaposed. Within this context, what primary principles might be incorporated to advance optimal health care? First, unbiased scientific scrutiny needs to be applied to existing therapies as well as to novel initiatives. With alarming rates of iatrogenic illness, current approaches and new ideas in both allopathic and nonallopathic care merit equal examination and critical appraisal. Clinical medicine should be based on credible, untainted research and reporting, reproducible observation, competent and compassionate health care, as well as (and most important) favourable outcomes for patients and populations—not on arbitrary notions of what is allopathic and what is alternative. Effective, sound science should be supported; ineffectual interventions should be discarded. However, the rigid demand that randomized controlled trials be required for legitimacy of any alternative care is absurd. Randomized controlled trial evidence is lacking for many conventional health-promoting interventions such as the health efficacy of seat-belt use, alcohol avoidance in pregnancy, tobacco cessation for cancer prevention, and even parachute deployment while skydiving.52 Other forms of evidence, such as epidemiologic research, can also impart scientific validation. Scottish legend Thomas Dewar once said, “Minds are like parachutes; they only function when open.” Much lip service is paid in academia to the importance of critical thinking, tolerance, impartiality, and independent thought. Yet, health care trainees are sometimes socialized to conform to status quo principles and to emerge as staunch protectors of their brand. All health disciplines need to be less defensive about their respective ideologies, and mainstream physicians should accept that exploration of innovative approaches is not a betrayal of conventional medicine. Careful consideration, scrutiny of scientific merit, and adoption of credible approaches should be the algorithm, not visceral dismissal of anything unfamiliar. Regulatory bodies need to fulfil their mandate of protecting the public. The incessant morbidity and mortality figures associated with standard medical interventions6,22–27,31 discredit the profession and challenge the very legitimacy of existing regulatory institutions. Authorities should adopt an outcome-based assessment approach by monitoring the aftermath of health care, rather than scrutinizing practitioner adherence to evolving standard-of-care credos, subjective opinions from conventional experts, or dubious practice guidelines.21 Regulatory agencies are sometimes accused of intimidating physicians perceived to be thinking outside of the box; instead they should protect the community by demonstrating concerted vigilance and scrutiny of contributions made by health care practitioners to the state of individual and population health. Results are the measure of evidence and should be the grid whereby health care and regulatory bodies are evaluated—insufficient attention to outcomes in an age of evidence-based medicine is incongruous and illogical. Furthermore, conflict of interest should be eradicated within regulatory agencies by eliminating affiliation with the sway of corporate science. Scientific journals must remain impartial, with decisions on merit governed by ideas and evidence, not ideologies. With ongoing resistance from scientific journals, Warren and Marshall struggled to publish their research data on H pylori and ulcers, leading them to conclude that gastroenterology was more about religion than science.43 All scientific approaches, not only those that fit a predetermined paradigm, should receive equal consideration. Peer reviewers should not be limited to those who exist within the confines of one approach and are philosophically opposed to iconoclastic ideas. While good health care makes sense, it does not make money; there is an inherent tension when profit underlies the evidence supporting the approach to care. Health initiatives not furthering corporate interests do not receive the same support or research funding as approaches that predominantly rely on the “have an ill, take a pill” algorithm to health care. Most postgraduate medical education is supported, organized, and undertaken by vested interests.50,53 The medical community must become apprised of the reality of profit-motivated research45,46 as an obstacle to clinical approaches that promote healing rather than chronic care, and interventions that favour education not medication. The word doctor, after all, originates from the Latin docēre, which means to teach. Medical instruction at all stages should remain the purview of public interest, not vested interests. Finally, knowledge translation needs to be expedited in our information age,38,39 and clinical medicine in all health care disciplines should keep up with sound science. No matter how attached health care providers are to their habitual clinical approaches, the stark reality is that new science often represents “the slaying of a beautiful hypothesis through an ugly fact.”38 In contradistinction to profuse evidence about disease origins,24 for example, much chronic disease care still presumes genomic predestination and persists in managing epiphenomena rather than addressing causative determinants within the exposome and epigenome.54–56 A historic paper in the American Journal of Cardiology highlights this state of affairs in relation to coronary artery disease,34 a leading cause of global morbidity and mortality. All safe and effective clinical approaches—mainstream, alternative, or any integrative permutation—should be committed to knowledge translation with expeditious adoption of credible emerging science. Challenging the status quo with adoption of new ideas and skills has always been, and remains, the customary path to scientific and clinical progress. Perhaps it is time to incorporate credible science and reputable evidence, whatever the source, into the practice of mainstream clinical medicine. Perhaps it is time to consider medicine without descriptors and to integrate outcome-based measures as the primary indicator of high-quality health care. Perhaps regulatory bodies should protect the public by securing compliance with health care that delivers safe and optimal results. Perhaps bridges rather than walls should be erected between fragmenting medical disciplines.
. “Conventional” and “unconventional” medicine: can they be integrated? Arch Intern Med 1998;158(20):2179-81.
. The increase of childhood chronic conditions in the United States. JAMA 2007;297(24):2755-9.
. Environmental determinants of chronic diseaseand medical approaches: recognition, avoidance, supportive therapy, and detoxification. J Environ Public Health 2012;2012:356798. Epub 2012 Jan 19.
. Why are doctors so unhappy? There are probably many causes, some of them deep. BMJ 2001;322(7294):1073-4.
. The rise and fall of the American medical empire: a trench doctor’s view of the past, present, and future of the U.S. healthcare system. North Branch, MN: Sunrise River Press; 2010. p. 44-117.
. To err is human: building a safer health system. Washington, DC: National Academy Press; 2000.
. Trends in alternative medicine use in the United States, 1990–1997: results of a follow-up national survey. JAMA 1998;280(18):1569-75.
. Alternative medicine worry hits boiling point. The Medical Post 2011 Oct 4.
. Doctors slam alternative medicine proposal. CBC News 2011 Sep 12. Available from: www.cbc.ca/news/health/story/2011/09/09/alternative-medicine-guidelines.html. Accessed 2013 Apr 25. Quackery abroad [JAMA 100 years ago]. JAMA 2012;307(21):2236.
. Making all the right moves: Foucault, journals, and the authorization of discourse. J Sch Publ 1999;31(1):20-41.
. Quackwatch: your guide to quackery, health fraud, and intelligent decisions. Chapel Hill, NC: Quackwatch; 2013. Available from www.quackwatch.com. Accessed 2013 May 7.
. National Council Against Health Fraud archive. Chapel Hill, NC: National Council Against Health Fraud; 2012. Available from: www.ncahf.org. Accessed 2012 May 22.
. Science-based medicine: exploring issues and controversies in the relationship between science and medicine. Science-Based Medicine; 2008. Available from: www.sciencebasedmedicine.org. Accessed 2012 Jun 6.
. Doubt is their product. How industry’s assault on science threatens your health. New York, NY: Oxford University Press; 2008.
. Where is the wisdom...? BMJ 1991;303(6806):798-9.
. Reversals of established medical practices: evidence to abandon ship. JAMA 2012;307(1):37-8.
. Scientific evidence underlying the American College of Obstetricians and Gynecologists’ practice bulletins. Obstet Gynecol 2011;118(3):505-12.
. Clinical practice guidelines we can trust. Washington, DC: National Academies Press; 2011. Available from: www.iom.edu/Reports/2011/Clinical-Practice-Guidelines-We-Can-Trust.aspx. Accessed 2011 Sep 18.
. Why guideline-making requires reform. JAMA 2009;301(4):429-31.
. The proliferation of clinical practice guidelines: professional development or medicine by numbers? J Am Board Fam Pract 2005;18(5):419-25.
. Reported adverse drug events in infants and children under 2 years of age. Pediatrics 2002;110(5):e53.
. Prescription-related illness—a scandalous pandemic. J Eval Clin Pract 2004;10(4):491-7.
. Incidence of adverse events and negligence in hospitalized patients. Results of the Harvard Medical Practice Study I. N Engl J Med 1991;324(6):370-6.
. Error in medicine. JAMA 1994;272(23):1851-7.
. Going into hospital far riskier than flying: WHO. Reuters 2011 Jul 21. Available from: www.reuters.com/article/2011/07/21/us-safety-idUSTRE76K45R20110721. Accessed 2011 Jul 21.
. Is US health really the best in the world? JAMA 2000;284(4):483-5.
. The Canadian Adverse Events Study: the incidence of adverse events among hospital patients in Canada. CMAJ 2004;170(11):1678-86.
. HealthGrades Patient Safety in American Hospitals Study. Denver, CO: Healthgrades Inc; 2011. Available from: http://hg-article-center.s3-websiteus-east-1.amazonaws.com/8b/76/afc5e3164c2ca8d8ed2ace1a7cd0/HealthGradesPatientSafetyInAmericanHospitalsStudy2011.pdf. Accessed 2013 Mar 24.
. A July spike in fatal medication errors: a possible effect of new medical residents. J Gen Intern Med 2010;25(8):774-9. Epub 2010 May 29.
. Temporal trends in rates of patient harm resulting from medical care. N Engl J Med 2010;363(22):2124-34.
. The neglected epidemic of chronic disease. Lancet 2005;366(9496):1514.
. An ounce of prevention. A pound of cure for an ailing health care system. Can Fam Physician 2007;53:597-9. (Eng), 605–7 (Fr).
. Is the present therapy for coronary artery disease the radical mastectomy of the twenty-first century? Am J Cardiol 2010;106(6):902-4.
. Permanent injunction order against AMA. JAMA 1988;259(1):81-2.
, translator. The genuine works of Hippocrates. New York, NY: William Wood and Company; 1891.
. What’s out there making us sick? J Environ Public Health 2012;2012:605137. Epub 2011 Oct 24.
. ACP Journal Club. What does it take to put an ugly fact through the heart of a beautiful hypothesis? Ann Intern Med 2009;150(6):JC3-2, JC3-3.
. History of evidence-based medicine. Oranges, chloride of lime and leeches: barriers to teaching old dogs new tricks. Emerg Med Australas 2005;17(4):314-21.
. The enigma of Semmelweis—an interpretation. J Hist Med Allied Sci 1979;34(3):255-72.
. James Lind’s treatise of the scurvy (1753). Postgrad Med J 2002;78(925):695-6.
. The monk in the garden: the lost and found genius of Gregor Mendel, the father of genetics. New York, NY: First Mariner Books; 2001. p. 1-263.
, editor. Helicobacter pioneers: firsthand accounts from the scientists who discovered helicobacters, 1892–1982. Victoria, Australia: Blackwell Publishing; 2002.
. Globalinc. : an atlas of the multinational corporation. New York, NY: The New Press; 2003. p. 1-165.
. The truth about the drug companies: how they deceive us and what to do about it. New York, NY: Random House; 2005.
. Is academic medicine for sale? N Engl J Med 2000;342(20):1516-8.
. Exploring the continuum: medical information to effective clinical practice. Paper 1: the translation of knowledge into clinical practice. J Eval Clin Pract 2006;12(1):49-62.
. Conflicts of interest in Toronto: anatomy of a controversy at the interface of academia and industry. Perspect Biol Med 2002;45(2):250-63.
. Pharmageddon. Los Angeles, CA: University of California Press; 2012.
. Selling sickness: the pharmaceutical industry and disease mongering. BMJ 2002;324(7342):886-91.
. Persistence of contradicted claims in the literature. JAMA 2007;298(21):2517-26.
. Parachute use to prevent death and major trauma related to gravitational challenge: systematic review of randomised controlled trials. BMJ 2003;327(7429):1459-61.
. Who pays for the pizza? Redefining the relationships between doctors and drug companies. 1: entanglement. BMJ 2003;326(7400):1189-92.
. Our genes are not our destiny: incorporating molecular medicine into clinical practice. J Eval Clin Pract 2008;14(1):94-102.
. Post genomic decade—the epigenome and exposome challenges. Swiss Med Wkly 2011;141:w13321.
. Discovering environmental causes of disease. J Epidemiol Community Health 2012;66(2):99-102.
. Unconventional medicine in the United States. Prevalence, costs, and patterns of use. N Engl J Med 1993;328(4):246-52.
. Mayo Clinic book of alternative medicine. 2nd ed. New York, NY: Time Inc.; 2010. p. 6-206.